Hi Friends! I already checked off my only New Years resolution this past week - to get a physical! It’s so hard to make these appointments when you’re feeling well and have a busy schedule. Visiting the doctor is something you carve out time for only when you’re sick, right? Matt and I both needed to get physicals as it had been a few years, so we made a date out of it and scheduled ours back to back. Mine started with a series of questions about my lifestyle, (Do you eat a well balanced diet? Do you exercise regularly? Do you get enough sleep? ), and with the choice of answers being limited to Always, Inconsistently, and Never, I found myself in the unavailable category of ‘Interested’. I am always interested in taking better care of myself and my family. I have spent many a late night in bed browsing information on essential oils, cancer fighting foods, and apparent toxins found in sunscreen. There is so much information out there - too much for me to handle, that’s for sure! It just isn’t feasible for us to make the number of changes that would be needed to avoid every single possibility of sickness. But small changes we can do! This past year I became more aware, (through my sister, actually! ), of some of the harmful ingredients in our day to day hygiene products, (soaps, lotions, hair care, etc). A doctor friend of mine who blogs about these topics shared a list of where to find healthier, ‘clean’ products. As I scrolled through, thinking I’m going to change our entire regime, I was stunned by the prices - and the quantities! $15 for 12oz of shampoo. Are you kidding? There are 5 heads of hair to wash in this house! And after dealing with lice this time last year I am not skimping on hair washing, people!!! It couldn’t have been better timing when Public Goods reached out to ask if I wanted to try some of their products. 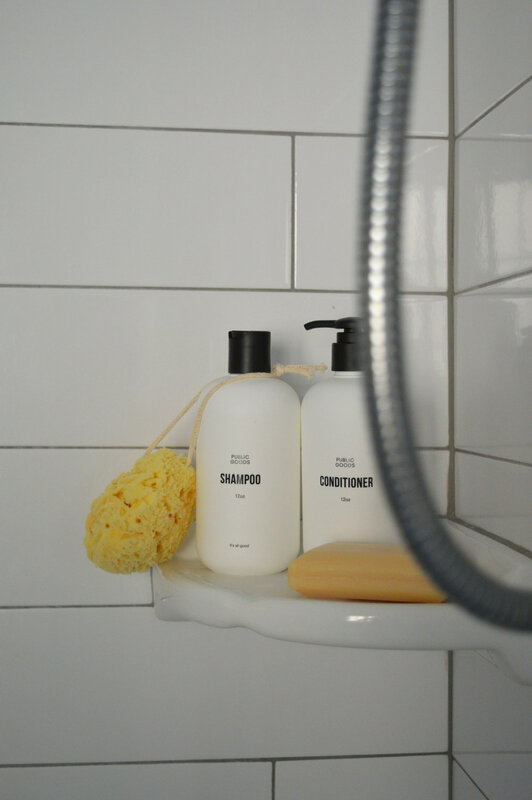 In their first email introducing themselves, they shared their desire to offer cleaner products for every day prices competitive to what you could find in a typical store. Game changer! Public Goods ingredients are similar to their packaging - they leave out a lot more than they put in. Both are clean, simple and high quality. Most impressive is the variety of products! They offer personal care, household cleaning supplies, linens, paper, oils - it’s an impressive line that doesn’t stop at just hygiene, or just household, as a lot of companies do. Since Public Goods is an online company, you pay a (very low) yearly membership fee in order to purchase their (very well priced) products. Items are delivered extremely fast, (mine arrived 2 days from when I placed the order), making planning ahead a cinch. Purse friendly and pretty, too. Health is always something we can do better on and I am okay with that. We’re still going to drink Swiss Miss and grab a weekly $5 deal at Little Caesars. But this is one change that is easy for me to make that I feel is worth it. These decisions are so personal as everyone needs to decide for themselves what changes are feasible for them. I’m so grateful for the opportunity to have tried Public Goods products and decide if they are worth swapping into our daily routine. If you would like to try, too, you can purchase one little item and then try out a free Travel Kit with smaller sizes of more items with code STYLEMUTT at checkout! Cheers to baby steps and small changes towards better health! A huge thank you to my Mom and Dad for lending their BEAUTIFUL master bath so I could share these products with you. (You DO NOT want to see my bathrooms). And thank you so much for coming by today!